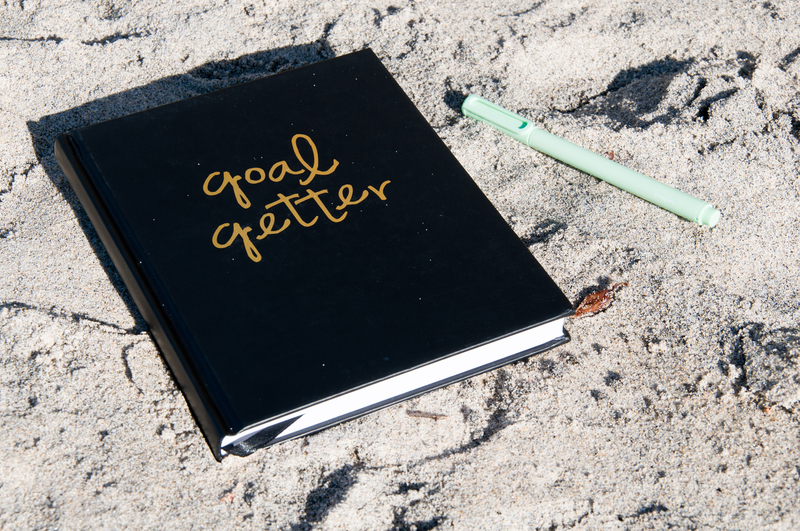 As 2015 winds down, many of us are prepping our New Year’s resolutions for 2016. Do you guys make resolutions? I always try to… and then seem to get so caught up in my own (typically unfounded) anxiety from just LIVING LIFE that I can’t remember what I resolved by the time May or June rolls around. Seems pretty inefficient, no? ADULTING IS HARD. If this sounds familiar, let’s chat for a minute. 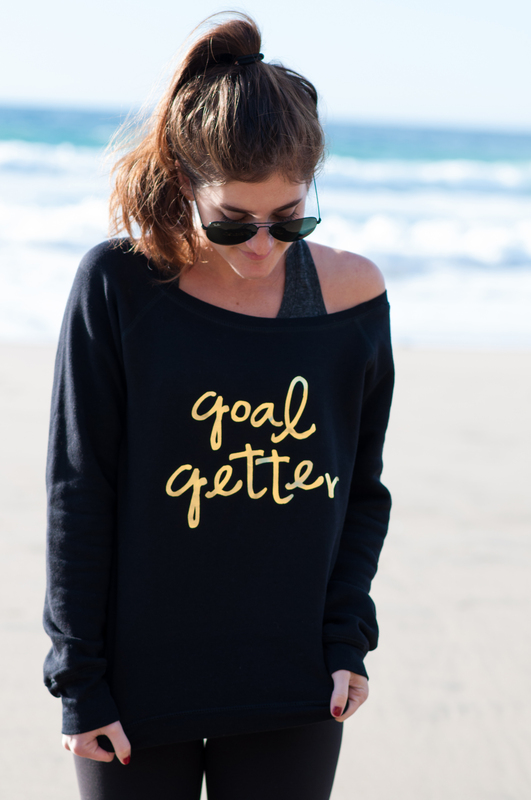 I worked for lululemon for a short time, and the greatest thing I took away from my time there (besides a sh*t ton of badass activewear) was their model for goal-setting. 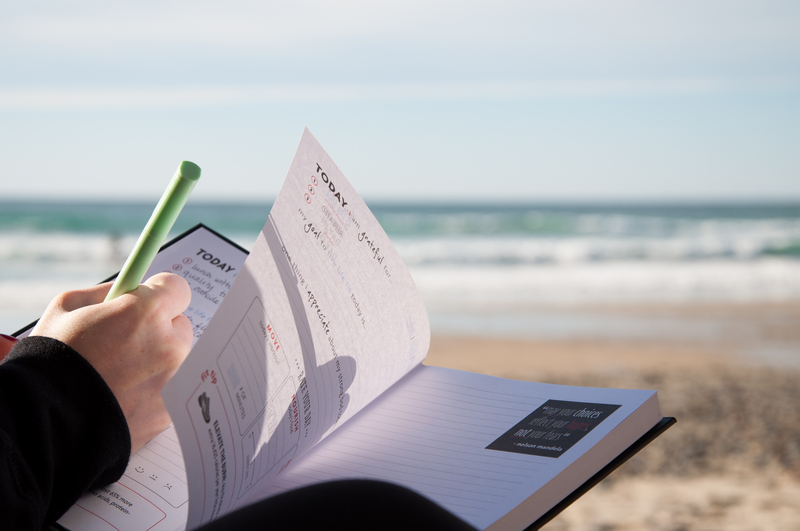 They force (okay, encourage) you to set tangible, typically quantifiable goals with a specific date. Keeps you from backing out or making excuses, really. If your typical approach to problem solving is “we’ll just cross that bridge when we come to it,” or, “I’ll figure it out later,” then start holding yourself more accountable. Don’t worry, I just had this conversation with myself five minutes ago. So this year I’m resolving to do a few quantifiable/measurable things – specific objectives versus ambiguous ideas. For starters, instead of “I’m gonna be healthier this year” or “I’m going to get a gym membership and then never use it,” – I plan to run either two half marathons or one full marathon (at least), with one race being out of state. That parlays me into my second resolution, which is to travel to three new places by the end of 2016. Perhaps your goals are a bit more abstract, and you’re planning on creating a theme or mantra for your year. My friend Avery did just that, and she has some incredible insight on her blog (check it out here). 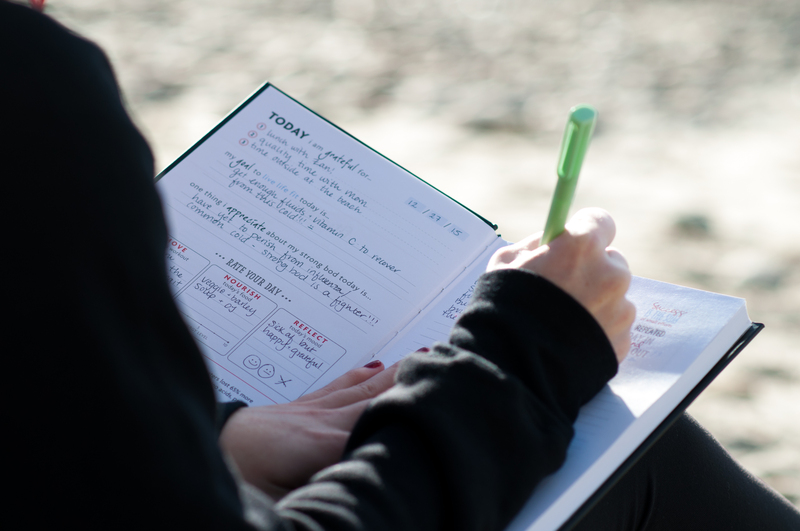 Either way, the best way to commit yourself to a goal for the year is to write it down. 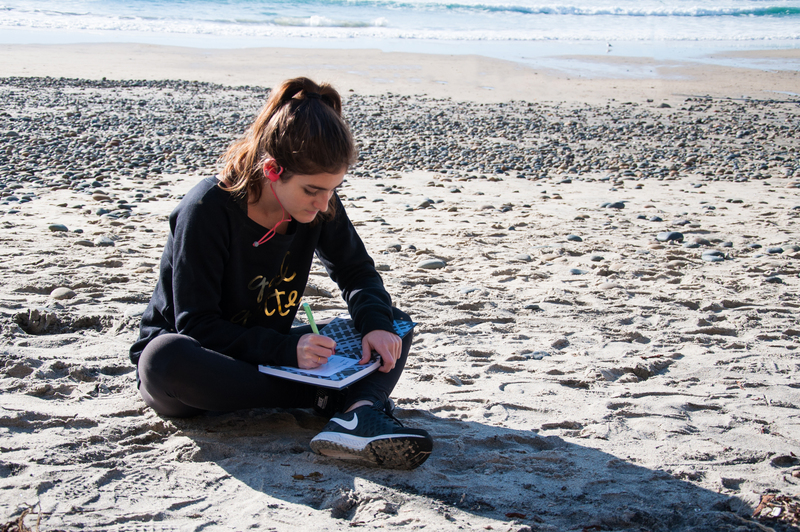 In my behavioral neuroscience class in college, we learned that writing something down – with a pen and paper! – boosts memory retention. Had I written down my resolutions this year, perhaps they wouldn’t have faded into the oblivion of my forgotten memories, alongside all those song lyrics I used to know and everything from every math test ever. y=mx+b!!!! Also, don’t be shy about bragging (when it comes to goal-setting… don’t get carried away you guys). Sharing with friends, making things public, and holding yourself accountable makes you 33% more likely to achieve your goal. It’s science. 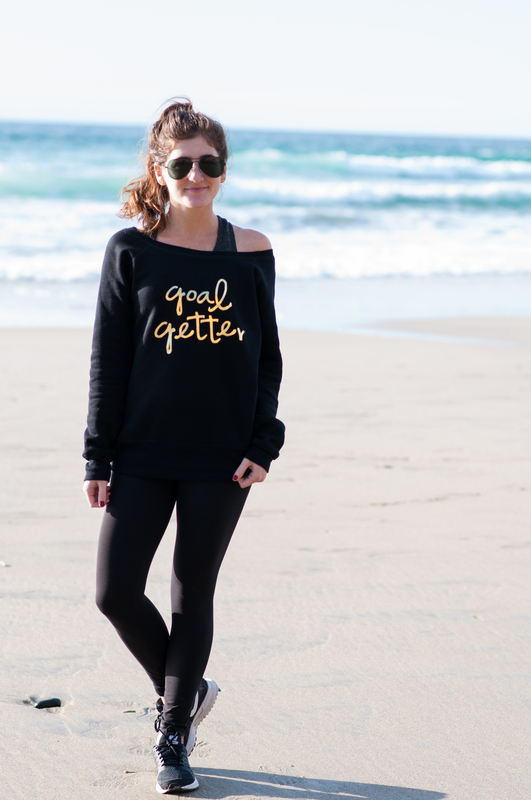 My friends at fitlosophy got me all set up with the tools for my 2016 goal-setting journey… including this sweatshirt to match my new journal! 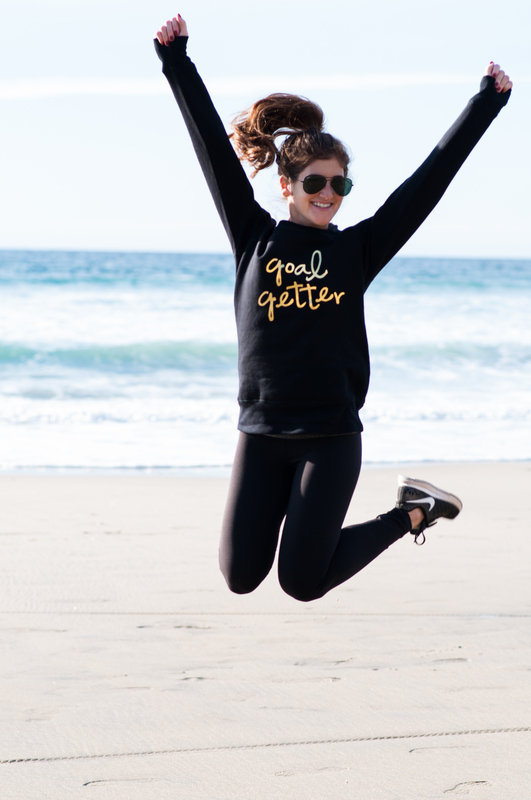 Yesterday they launched their “goal getter” journal at Walgreens (it’s the only place you can get it! 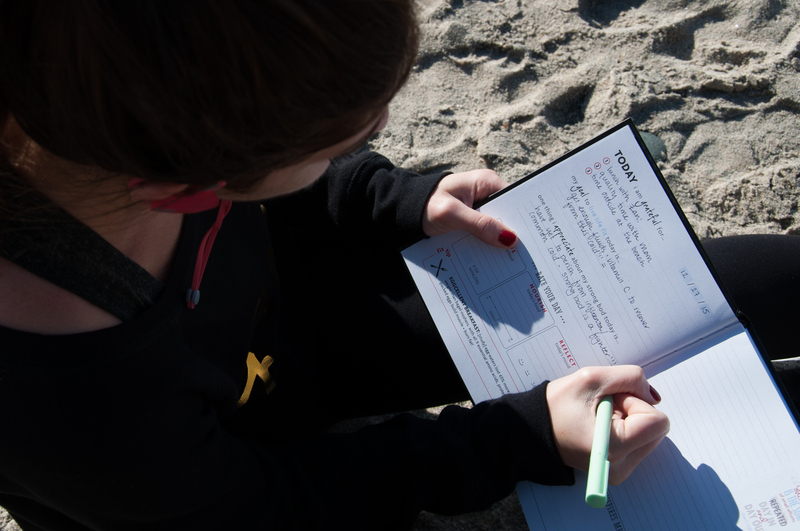 Find a store here) and to celebrate, I took mine down to the beach at D Street, cracked it open and started to journal. First of all, how cute is this thing? I’m a HUGE fan of gold, if you guys haven’t been able to tell. But what I love most about this journal (besides its gilded decor) is the fact that it leads off with gratitude: what are you grateful for today? Taking time to purposefully focus on the positive things in your life is crucial to living with more happiness and intention – and for goal-getting. 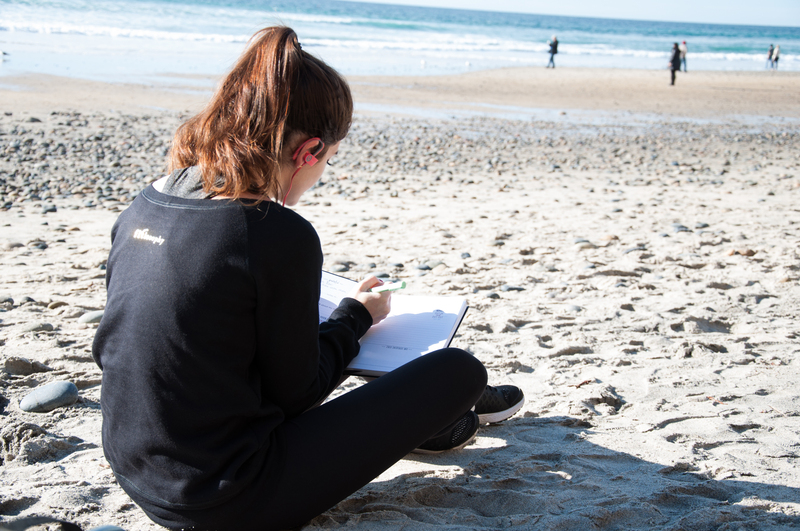 At the time I sat down to start journaling, I was feeling sick and lethargic (read: current mood = blehhh), but once I took a moment to reflect on the good things in my day, my mood changed. I have some big life changes coming up, so it felt really good to sit down and journal. I write all day long almost every day, but it’s always for the purpose of creating content. It was such a refreshing (and unexpected) change when I was writing just for ME. Sometimes you need to start with small goals, like losing all your midi rings in one day (jk jk but seriously it’s so easy). You’ll be so surprised at how quickly you can give yourself a confidence boost by starting with a small, feasible goal. Use that confidence to fuel your bigger, loftier goals. My goals yesterday were focused on the current cold I’ve come down with, and recovering instead of forcing myself to work out. Before you get started, make sure you have all the tools to succeed. Does getting a great new pair of yoga pants make you more inclined to work out? 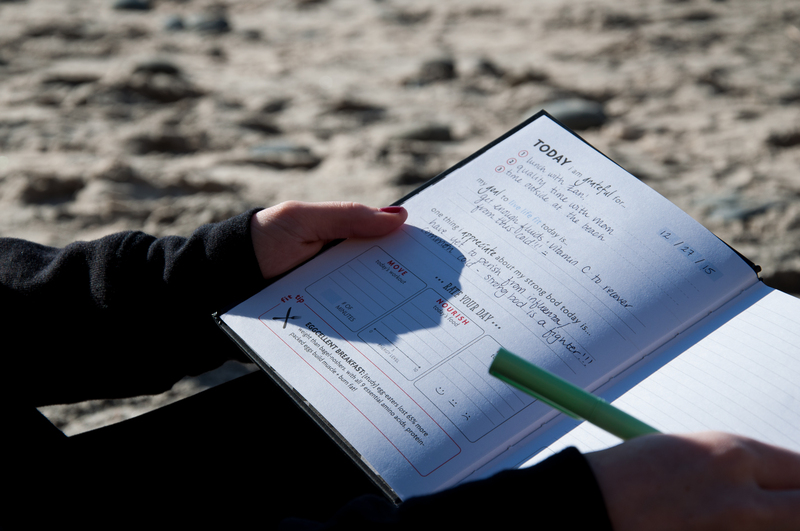 What about a goal-tracking journal? How are you planning on holding yourself accountable this year? I CAN HELP! And so can fitlosophy!! Drumroll please…. 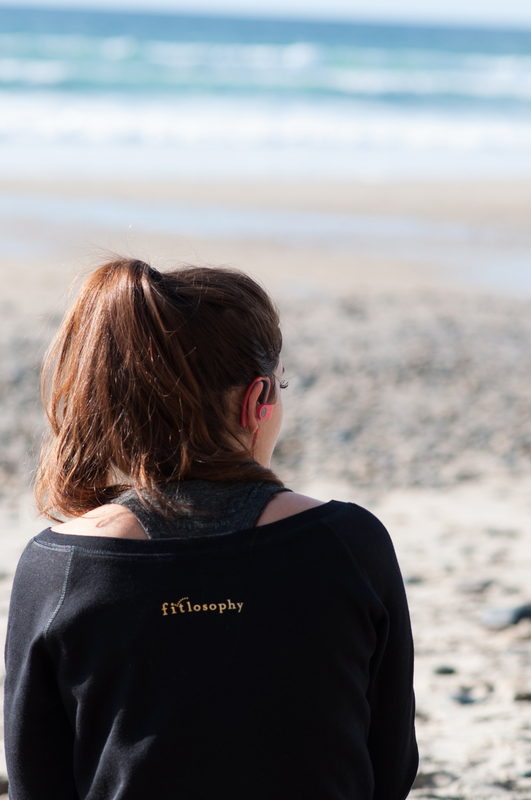 presenting the first ever *giveaway* on beauty & the beach, thanks to fitlosophy. 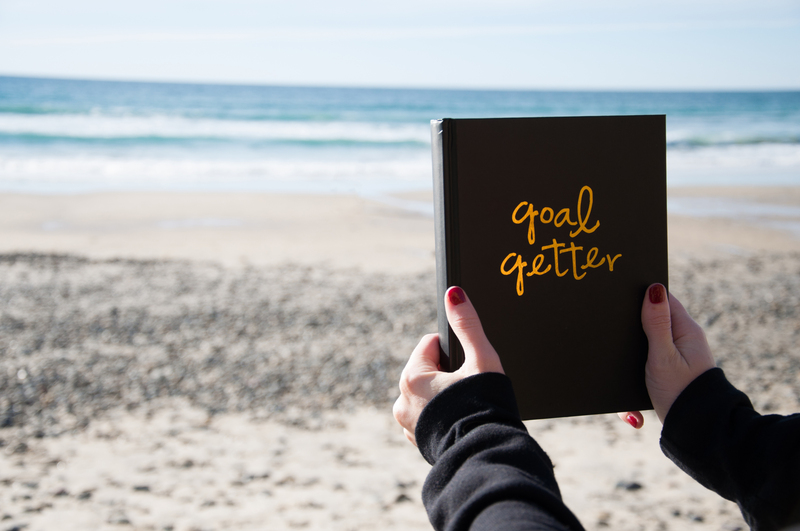 We’ll pick a winner to receive a set from fitlosophy, including the goal getter journal, the food scale, and the fitbook lite 6-week fitness and nutrition journal. Consider it the essential starter kit for a healthy, kickass 2016. Make your resolutions and enter before midnight 1/1/16 and I’ll announce the winner by the following Monday. You can also enter the fitlosophy x Walgreens giveaway here. Stay tuned for a pretty big announcement in the New Year. Until then, have a wonderful and safe holiday! Get all your gear for your resolutions and goals (hit up your local Walgreens), and be sure to enter the giveaway in the comments below! 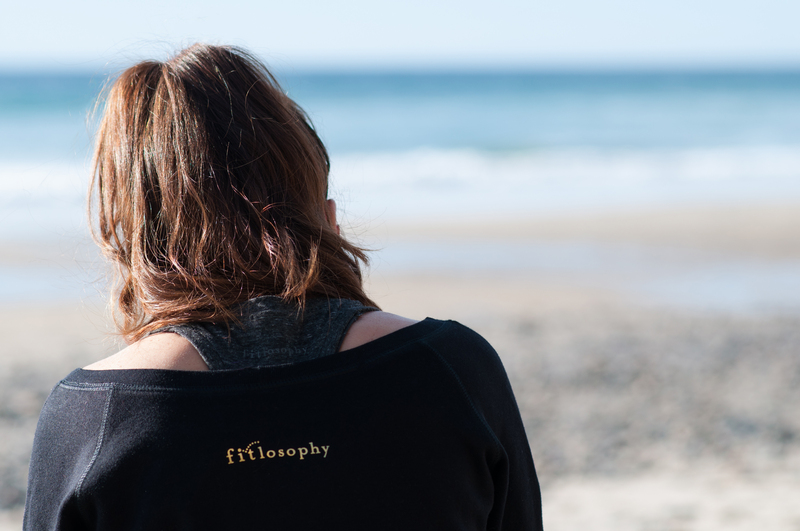 Thank you fitlosophy for partnering on this post! My goals for 2016 is to get fit. I always wanted to achieve the goal of getting abs and having a tone body, but I never really worked towards that goal. However, this year I will definitely make it happen. My second goal is to do exceptionally well in college. It’ll be my second semester in college and I am looking forward to learning new things and working a lot harder than I did to achieve the grade I want. My number 1 goal for 2016 above all else is to remain happy. Two years ago I got sober, found the man of my dreams, and put my life back together. I can’t believe how amazing y life is now and I never want to take anything for granted. With that being said my number 2 goal is to get healthier. I need to make some diet and exercise changes. I need to cut the soda and sweets from my diet and I need to be more active. I just joined a yoga class and I can’t wait to go! For 2016 I really want to take better care of myself. In 2013 I was diagnosed with thyroid disease and let it take over my life and my plan for 2016 is to stop letting my illness stop me from living my life. I really want to be a healthier and more confident me! Thanks schmooze for making me be accountable for a resolution. I plan on 2016 being MY YEAR! In January, I will be promoted to Group Leader with Touchstone Crystal earning $36k+ & that’s just my parttime business. I also am looking to earn the trip to St Maarten in June, that Touchstone rewards it’s top sellers too, did I mention all expense paid?! Saving will be a big part since my bank account hates my lifestyle. Also in 2016, I plan on moving to Florida – come visit whenever. And let’s not forget, my every year resolution to get in shape, but this year I’m breaking it down into 4 days a week @ the gym & really just watching what I eat! Happy New Year!! Love your blog & miss you! Continue to eat healthier and smaller portions. To continue using my Nike run app and Hike at least 3 miles every day. Go to church every week. Lose 10 more pounds while gaining more muscle and hopefully not having any surgeries this year. Hopefully get to Hawaii or back to Europe and spend a month in Italy. In 2016 I would love to write another book or 2. I finally self published this year and it was so satisfying. Would love to take it a step further and see if I can pop out another one!